The next film to be shown by Worthing Film Club at The Connaught is the Cannes Film Festival's Jury Prize winner 'THE LOBSTER'. This is screening on Monday the 5th of September at 8.15pm, at the Studio, Connaught Cinema, Worthing. 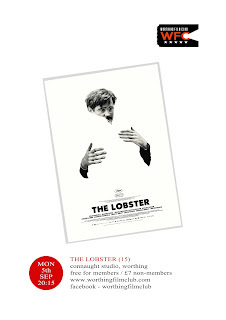 This absurdist dystopian dark comedy is Yorgos Lanthimos (DOGTOOTH; ALPS) English languague debut starring Colin Farrell as a newly-single man given 45 days to find a romantic partner or he'll be turned into an animal.